Back when I was in art school our assignments were always open to interpretation. You could sometimes get more points for being clever rather than completing the assignment “correctly.” I always did my stuff the way the professor expected and I was sometimes jealous of what some of the other students got away with. I had my revenge in my senior year. While most everyone struggled to haul around their giant canvasses or bulky portfolios all I had to carry around was my little folder of Biff cartoons. I don’t know. After using the all-purpose flour as a drain cleaner, I never had to worry about the hair clogging the drain. Huh. The all purpose flour package seems to have grown. You know, interestingly enough I think I’ve actully heard of an artest out there that does use flower and other “organic ingredents” to do his/her paintings. The pun… the horrible, horrible pun…… It hurts… IT HURTS!! Trueblaze: Do you remember his name? I’d like to see that. Yeeeah I don’t like canvas. They are so big and there’s never anywhere to put them :(. Sketchbooks forevah! written paper wasn’t what he assigned. 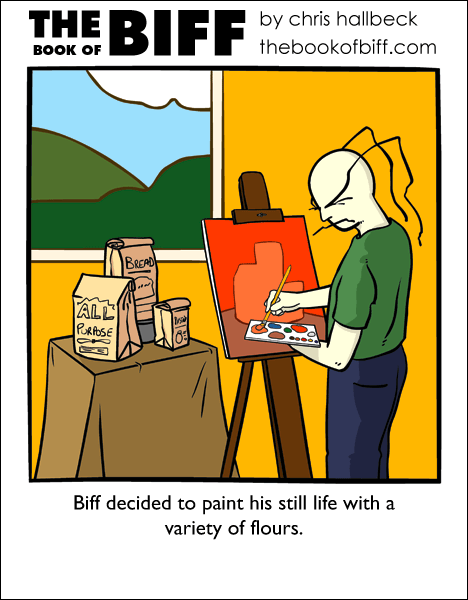 assignment in all purpose flour. wait, what? just how old is biff? Lucretiel – Biff was first drawn in Nov 1990. If you ordered the book, the complete story is in there. For the horrible pun, Biff must suffer some equally horrible fate tomorrow! Well, he took something too literally again. Sounds like something I’d do. I should really try doing that sometime xD. Reminds me of that movie about that guy whose life was being narrated. You know what creeps me out? Baking soda! It’s..odd! It can be used in cooking, cleaning and smoothing your skin, cleaning your clothes, removing pet stain odors and someone even said you can bath with it and turn it into a bubble bath oatmeal type thing. …you did Biff for your art course? How’d it go? I know people who brush their teeth with baking soda.